Designed to dynamically respond to changing light conditions, smart windows are among the most advanced façade components. However, most of these products do not live up to their descriptor—after all, if they are not connected to the Internet, how smart can they really be? New software-controlled glazing products can have built-in Internet of Things (IoT) technology, allowing direct online connectivity just like a computer, smartphone, or tablet. Based on advanced electrochromic (EC) technologies, this generation of smart-tinting glass is able to respond directly to building management software, as well as securely monitor and control the glass remotely. This type of connectivity also futureproofs façades by allowing them to use up-and-coming—and even yet-to-be-developed—building technologies. The most important technology for any smart-tinting glass is Internet Protocol version 6 (IPv6), which is the worldwide standard for identifying and locating devices on the Internet. Every device communicating online requires an IPv6 interface. This includes cameras, smartphones, unmanned aerial vehicles (UAVs or drones), and a building’s HVAC, lighting, elevators, and security systems. Smart-tinting glazed assemblies comprise two thin layers of glass, each with a microscopically thin conductive coating. Coated on these thin conductive glass panes are layers of chemical compounds creating an anode, cathode, and insulating conductor sandwiched between the two panes. When a low-voltage electrical charge is applied to the glass, ions are moved between materials to darken or clear the glass. EC glass has always had an advantage over other active glass technologies because no additional electricity is required once the desired tint is achieved. However, it is now possible to monitor and communicate with glass in real time. Integrating smart-tinting glass with a building’s mechanical and electrical systems also allows a level of control heretofore unseen. This glass can work with HVAC and lighting to balance temperature and light (both ambient and artificial) throughout the day. Since each window has its own IPv6 address, this can be done on an office-by-office basis—whether the space is north- or south-facing, or internal or external. In a north-facing office, the smart-tinting glass can modify to let more natural light in to compensate for the dimmer ambient light, while in a south-facing office, the glass would dim to compensate for the direct sun. Smart-tinting glass with IPv6 can take advantage of cloud-based devices designed to enhance occupant productivity, such as voice assistants. Someone entering a conference room to use the projector would say, “Dim the room for a presentation.” The command would trigger the smart-tinting glass to dim to its darkest levels, turn off the lighting, turn on a podium luminaire, and adjust the temperature in the room for the darkened conditions if necessary. This level of integration not only meets the needs of individual office users, but also forms the basis for total smart building management. Smart-tinting glass allows for dynamic control of the façade to reduce unwanted effects of heat and glare while balancing energy use for lighting and HVAC and allowing for individual needs to be met. This makes it easy to monitor where there are potential improvements for efficiency, offering the opportunity to reduce energy costs while keeping an eye on increasing occupant comfort. Smart-tinting glazed assemblies comprise two thin layers of glass, each with a microscopically thin conductive coating. When a low-voltage electrical charge is applied, ions within move between materials to darken or clear the glass. 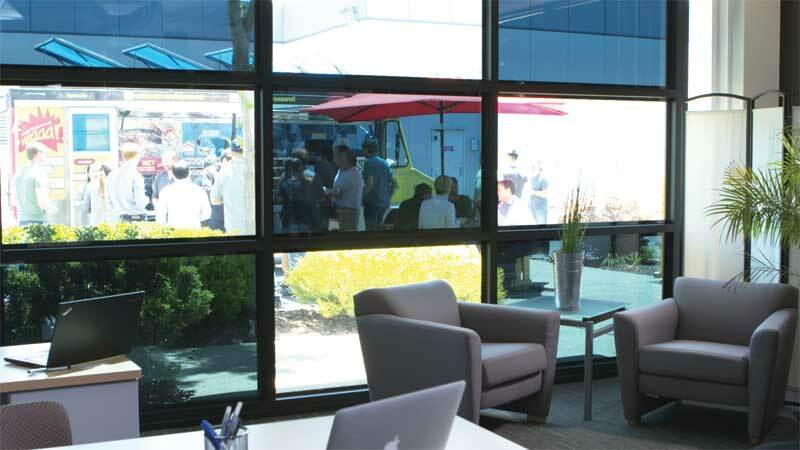 Built-in IoT connectivity dramatically expands the functionality offered by smart-tinting glass, enabling it to provide the same benefits as multiple building technologies. It can perform solar shading, daylighting control, and offer a dynamic solar heat gain just like mechanical dynamic façades. However, these glazed assemblies do not require the maintenance needed for traditional mechanical façades or automatic shades, which must be factored into a building’s operational expenditure. The majority of dynamic window technologies—including thermochromic, polymer-dispersed liquid crystal (PDLC), and suspended particle device (SPD)—currently have no way of employing cloud-based technologies. Thermochromic technology is technically ‘passive,’ dimming according to the temperature of the glass—tinting when it is hot, and clearing when it is cool. Short of manually applying heat to the glass, users have no way of controlling opacity. PDLC changes its opacity by changing the orientation of suspended liquid crystals, scattering light or letting light pass through, depending on the voltage. Voltage is usually applied with a manual switch to deliver privacy on demand. As a constant voltage is required to maintain a clear state, its use has largely been limited for interior applications. SPD is a film-based technology that uses suspended microscopic particles between layers of glass, tinting when it receives an electrical charge. This means power must be sustained in order to maintain the tinted state. Dimming instructions for both SPD and PDLC are typically applied manually, much like a light switch, and are typically closed systems with limited capability to connect to other third-party systems. The ability to easily ‘talk’ to other building systems, provide feedback on how it is being used, and offer interoperability with other IoT technologies means smart-tinting glass can have an immediate impact on building performance. For example, one can consider a building that turns off its air-conditioning on the weekend, but needs to turn it on before employees arrive Monday morning. If it is a sunny morning, the building management system can fully dim the smart-tinting glass and turn on the HVAC to get the building to the desired temperature quickly. However, if it is cloudy, the windows do not have to be dimmed and the HVAC can still work as efficiently as possible. a constant light level inside. This optimal lighting management helps reduce overall lighting costs. With such fine-grain control over the glass, it is easy to give office occupants control over their workspaces, as individual settings can be reset or overridden by the central building management software. Perhaps someone needs to reduce glare because of where she is sitting in the office, or another person requires more light because he is closely inspecting an item. If someone needs privacy, using smart-tinting glass as part of the internal office façade allows this. Smart-tinting glass’ ability to block up to 99.9 percent of visible light enables on-demand privacy, making it suitable for interior partitions and office walls. As electricity is only used during switching, smart-tinting glass can be set to ‘clear’ or achieve various levels of tint for aesthetic or privacy reasons. Some smart-tinting glass can appear like normal low-e glass in the clear state and tint to less than three percent light transmission. All these factors play to increasing occupants’ wellness, comfort, and productivity while still allowing for overall central management of the building systems. 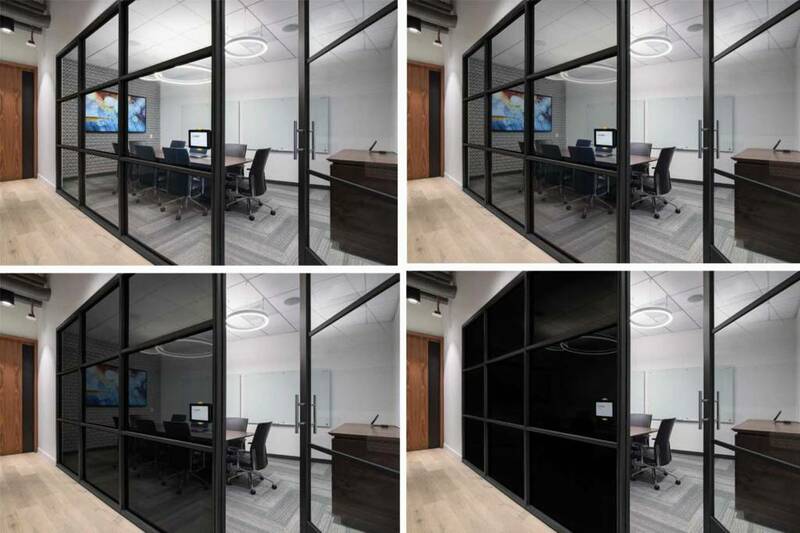 As smart-tinting glass solutions tint quickly and uniformly, they are being used for interior walls and partitions and growing in popularity for conference rooms and executive offices. Advanced electrochromic (EC) glazing enables control of glare and privacy, as well as aesthetic flexibility. New buildings constructed with the Internet in mind enable a higher level of service and security with an easy integration into the latest building automation technologies. With the right cloud-computing and security systems in place, cloud-based systems can be more secure than onsite data storage. Having components use the latest IP standard means accessing building automation systems through multiple interface types, including dedicated consoles, desktop computers, smartphones, or voice assistants. Since most people have a smartphone, a facilities manager can grant occupants control over their own spaces. fact, cloud services permit management of multiple buildings by a centrally located team. Over time, with the data and management centrally stored within the cloud, systems can be designed to model energy use and programmed to respond to occupant needs, both maximizing comfort and minimizing energy costs. This type of future functionality would be impossible without built-in IoT technologies. a must-have in this respect; it is the intelligence making the difference for smart-tinting glass both now and in the future. 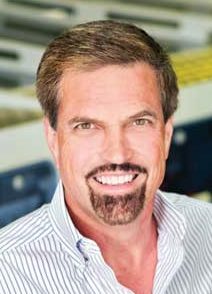 Paul Nagel is senior vice president of product development for Kinestral Technologies. Previously with Control 4, 3Com, and Compaq (HP), he has extensive experience in developing, building, marketing, and selling consumer lifestyle technology products. Nagel holds a degree in electrical engineering from the University of Utah. He can be reached via e-mail at pnagel@kinestral.com.